So at the end of rest day number 2, I haven’t quite managed to finish Stalagasaurus clean yet although I feel better today than I did when I pumped out yesterday. It’s such a big mental game. The height, the gradient, the possibility of success, the potential of falling… It’s all factors that intimidate me. But I know all it takes is just to keep pushing through until you get used to the height, the gradient and the falling. The possibility of success… Well, that’s not something to fear but I do come across it every so often. The slight hesitation of “if I finish this, then what next?”. It sounds silly, but I hope I’m not the only one who gets it. Rationally I know I am physically capable of redpointing the climb. I’ve done all the moves separately with absolutely no trouble – three times in fact. It’s just stringing it all together and not over gripping. Sport climbing is still such a new ballgame to me but I’m as impatient as a toddler who’s just learnt to walk. I want to get better, I want to push my grade. These will be the thoughts I need to hold onto when the pump is on and I’m battling to finish my project. Just to log on my personal blog that Ed and I managed to dog up a 6c+ today which is very doable for a redpoint project. Oh, it’s on. Just finished day 4 of the first part of this trip. Arrived late on Saturday, had three days climbing and then had a rest day today. The first two weeks I’m out in Tonsai with my friend Ed out to sample the rock in the area famous for its climbs. The area is beautiful with red, streaky behemoths of limestone rising out of the sandy tropical landscape decorated with green foliage on top and in the large caverns. To get here we flew to Bangkok and then changed to Krabi, flying a total time of 14 hours. Once you get to Krabi Airport, look for the shuttle bus that gets you to Ao Nang pier for 150 bahts. This should take between 45 mins to over an hour. 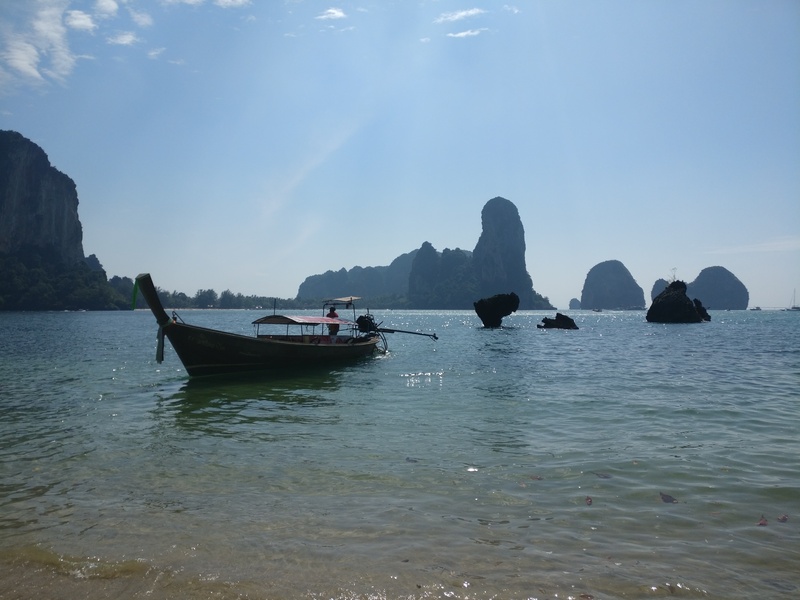 Once there, you can get a boat to Tonsai. During the day this would be 100 bahts per person but after around 6pm, it goes up to 150 bahts pp. The boat will only go once they’ve managed to get ten people – the boat guys won’t make the trip for less than 1,500 bahts per boat so we ended up having to share the cost of the last boat (9.30pm) with another couple, making it 375 bahts per person. At the time of writing, the exchange rate we got was roughly 43 bahts to 1 GBP. Tonsai is a funny place. It reminds me a little of Masouri on Kalymnos in Greece in that it’s heavily geared towards climbers except in a much more bohemian and hippy sort of way (every bar here seems to be equipped with slack line and barman with dreadlocks). It’s also much smaller. We’re here in mid Jan and even now it is hitting highs of 33 degrees during the day with 100% humidity most days. It does make friction a little less of a companion. I’m fairly well accustomed to hot temperatures (often preferring to climb in warmer climates) and even I’m struggling a little with the heat. The rock is good with interesting features. We’ve had three days of climbing so far and at two different crags. So far, I would say that the climbs are hard for the grade – that’s accounting for the tougher conditions from the heat and humidity. I will revise this first impression later on. Hopefully now that we’ve had a few days to acclimatise to the timezone and weather we might just strap a pair on and start actually working on some harder stuff. So far we’ve not climbed above a 6b. I would recommend sport climbing in a three, as I would for most climbing trips as I find it helps pace the days much better. Unless you’re an aggressively athletic it’s very easy to over climb and burn out in a pair whilst anything above three means too long of a break in between climbing. Luckily Chloé, someone I knew from a bouldering gym back home, happened to be here in Tonsai at the same time so we’ve managed to snap her up. Particularly when the days are uncomfortably hot and humid, it’s always good to have an extra person that’s enthusiastic to keep up morale. After a pretty relaxed beach, stretching and slack-lining rest day, we’re back to it tomorrow. There looks to be rain in the afternoon so hopefully we can be quick with getting some climbs in in the morning!